The Corgidor is a medium-sized cross between a cardigan Welsh Corgi and a Labrador Retriever. There does not appear to be an established history for the mix, but some say the hybrid was created to herd cattle. Because hybrids are not a breed but crossings of two breeds, their exact look will vary between individual dogs. They hybrids tend to be medium-sized dogs. Generally, you can expect a full-grown Corgi Lab mix to weigh 40 to 55 pounds and stand 12 to 20 inches high. Examples of the mix are most likely to appear to look like a Labrador Retriever but with stockier, shorter legs like a corgi. Coat colors can be solid red, brown, black, chocolate, yellow, or a mix of one of the solid colors plus white on the chest and belly. They tend to be athletic dogs with good musculature and a similar head shape to a Labrador's but smaller ears. They will also shed more than a Labrador Retriever, if they inherit the corgi's thicker coat. The Corgidor's temperament will vary based on how much they have taken from each parent. Labrador Retrievers are known for being friendly, loyal dogs who are a very popular family pet. Corgis, on the other hand, can be a bit more difficult as they can be aggressive to people due to their herding dog nature. They also can be very energetic and protective and are known to bark often. If you bring home a Corgidor puppy, remember it is a hybrid, and you won't know for sure how your dog will be as an adult. This means you should spend more time working with your new puppy than you may have anticipated. This extra time and care will pay off with a behaviorally sound and well-trained adult dog. Every Corgidor puppy owner should implement the following. Since you will not know for sure how big your puppy will get, you weigh them at 14 weeks and then double that amount for their estimated adult weight. Another method is to weigh them at 6 months of age, which should be about 75 percent of their total adult weight. You should enroll your Corgidor in a puppy class to socialize him to other people and animals. In addition to your work in class, take him out with you to as many places as you can that are dog friendly and pair this with things he likes such as food treats, toys, and petting. You want him to enjoy meeting strangers and other animals to help minimize or hopefully eliminate the corgi tendency toward biting and protectiveness. Because corgis are known for being serious barkers, start training him as a puppy to get a handle on this behavior. You can teach him not to bark on cue and other obedience behaviors, such as coming when called, to give yourself a full tool box of alternate behaviors when he's a grown dog. 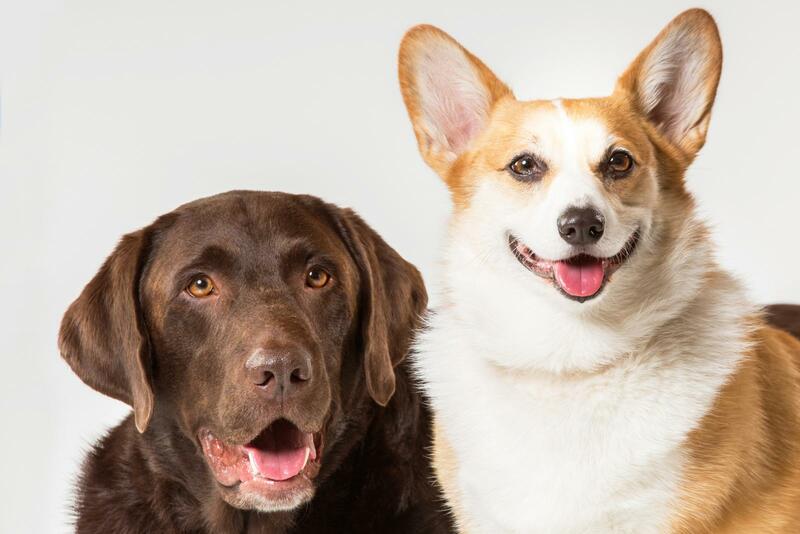 Both corgis and Labradors are active, energetic breeds that need vigorous daily exercise. Both dogs were bred to work whether it was herding livestock or hunting in the field. If you live a sedentary lifestyle, this is not a good choice for you unless you plan on implementing a new canine-powered exercise plan for yourself! These dogs are also likely to enjoy swimming and any outdoors activity. If you want to buy a Corgi Lab mix puppy, expect to pay from $750 to $1,500. Since this is not a breed but a hybrid, you should be diligent about interviewing the breeders who are offering Corgi Labrador Retriever mix puppies for sale. It's a good idea to meet the sire and dam and ask for references from past buyers if possible. If you are looking to rescue a Corgidor puppy, check with the Petfinder website to see if there are any at shelters and rescues local to you. Is A Corgidor the Right Dog for You? Corgidors are a good match for an active household that wants a medium-sized, energetic dog. They can do well with other dogs and older children but due to their corgi half, interested adopters should be aware of the potential for aggression and barking and be willing to commit to actively socializing and training the puppy.